The Balkan Photo Festival and PROFOTO will organize a photo marathon on Saturday, Jan 28, 2018, from 12:00 to 14:00 hrs, at VTF Studio, located at Terezija bb. The jury consisting of Danijel Berković (PROFOTO ambassador for Croatia) and Eldin Hasanagić (VTF Studio) will select the winner who will receive the Profoto RFI Softbox OCTA 3“ (90 cm) + Profoto RFI speedring adapter, an approximately 350 EUR value award. Please submit your applications to this email address: info@balkanphotofest.com by 15:00 on Friday, Jan 26 with your name and phone number. All selected participants are required to attend the PROFOTO presentation at the National Gallery of Bosnia and Herzegovina at 10:00, on January 27, 2018. 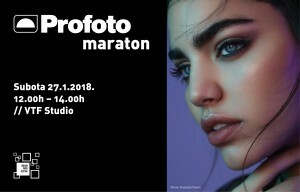 The winner of the PROFOTO Marathon will be announced at 15:00, on January 28, 2018, at the PROFOTO booth, Photo Fair.